If you dare to do this month's challenge with the Daring Bakers one thing is for sure, Yule also Log HOURS in the kitchen and dirty every single pot you own. And the results may or may not be worth it depending on a few things. A. Do you like really rich desserts? B. Do you have the patience of a saint? C. How much unflavored gelatin do you have on hand? See!! I got all six but despite my best efforts, the layers still slipped and slid around in the mousse and I was definitely not liking this recipe for Creme Brulee. In my house the results were well worth the time I spent in the kitchen even if my log isn't exactly the picture of perfection (See Letter C above). My dad adored the dessert and has asked every night since Christmas dinner when am I going to make it again. 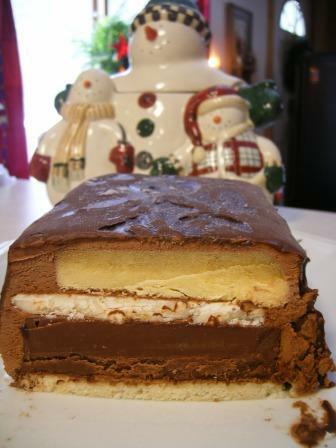 I hate to tell my dad that I probably won't be making this exact version as I found the effort to make it not worth the results (a little over the top, HATED the crisp) but I'm keeping the mousse and dacquoise biscuit recipes because they were quite tasty. This month is my return after a couple month hiatus from Daring Bakers to deal with some personal things going on in my life. Go check out my fellow Daring Bakers to how they fared with the challenge.